Along with looking into my credit score, another item on the long, running list of "I have really got to get around to doing that" chores is archiving my photos. You all probably remember the Great Computer Incident of 2008, also known around here as Why I Hate Best Buy/the Geek Squad and Why You Should Too. Just because I didn't (don't!) have a home computer to upload my photos wasn't going to stop me from taking them. July will be two years without a home computer. Clearly, I have one at work, and so it has the means of storing all of the photos I have taken in that time frame. This has never sat well with me. I have heard horrible stories of people losing their jobs and with it, years and years worth of documents and photos. Not smart, people. Not that I am in fear of losing my job, but I would much much much rather play it safe than sorry. So, after some inspiration from a cool article in Real Simple magazine, I purchased some blank CDs and sleeves over the weekend. While I have been at work today, I started on Operation Archive. Using my computer and a Sharpie, I've added photos to the discs, labeled the disc and the sleeve, and am even using different color sleeves to boot. Look at those black CDs. 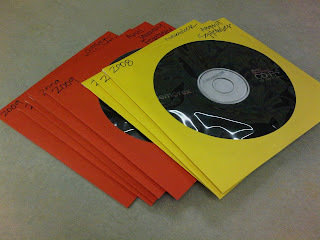 Should those have been in a spool of "Cool Color" CDs? I don't think so. I figured better to write on them for the occasional use when I was at a desk, as opposed to being behind the wheel of my car trying to see what the heck is written on this CD I might want to play. Even if all of your digital photos are safe and sound on your home computer, I recommend starting a backup system ASAP. When my old computer died, the hard drive was in tact so the photos are recoverable, but that is not always the case. The woman featured in Real Simple deletes the photos after she puts them on a disc and she also does them by occasion - one trip, one birthday party, one event per disc. That's a lot of discs! I can't bring myself to do either of those things, but maybe in the future. One step at a time! Spring is a great time get organized! Don't you agree?